A quintessential Portuguese scene at the Feira Da Ladra market. Shopping for ceramics at the LX Factory Sunday Market. We kicked off our first day with a visit to the LX Factory Sunday Market. It was alive with artists and designers selling trendy wears, alongside live music, buzzy cafes, and hip boutiques. Street art inside the LX Factory. The culinary scene in Lisbon is really exciting, with incredible food markets and hip, creative restaurants producing interesting fusion dishes. The wheat bread at Prado is served with with fresh goats butter with smoked salt and sea lettuce, and whipped Iberico port fat with garlic and bay leaf. We had an amazing meal at Prado to celebrate Mother's Day, and the desserts were especially interesting. We had mushroom ice cream with pearl barley and dulce de leche, and corn bread ice cream with sweet potato and hazelnuts. 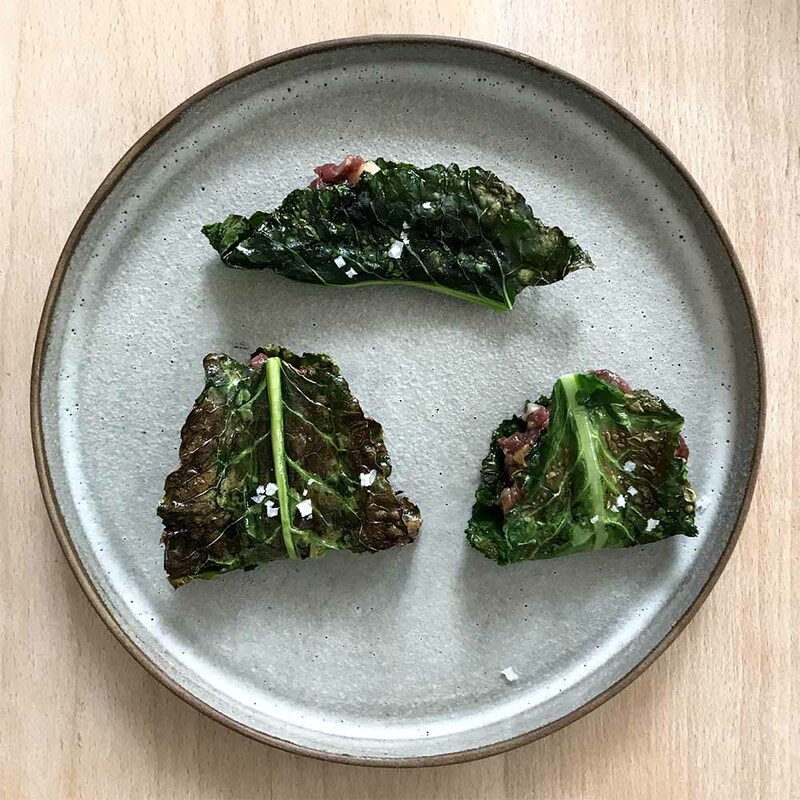 Anther share plate at Prado; crunchy parcels of beef tartare with shiitake and grilled cabbage. There is breathtaking architecture all over Lisbon, and it's a pleasure to just walk the streets and soak it all in. 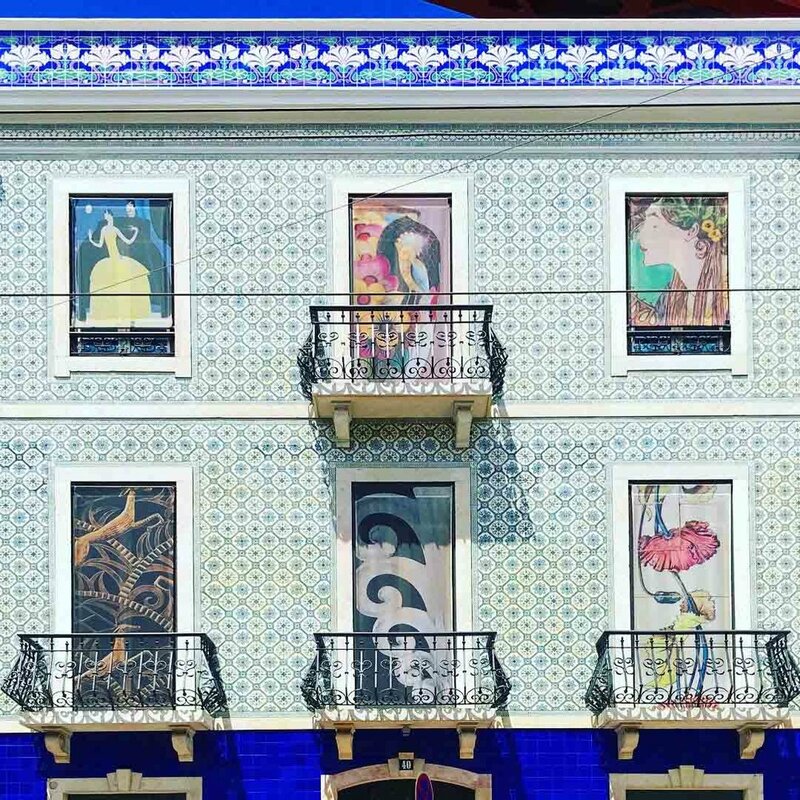 These 'Azulejo' tiled buildings are typical in Lisbon, and are so distinctly Portuguese. One evening we popped into the Time Out Market for cocktails. They take their Gin & Tonics very seriously in Lisbon, and these ones at a vendor in the Time Out Market were delicious! Portuguese cuisine is also famous for it's seafood dishes, and it's yet another thing to love about the food scene in Lisbon. The most sensational prawns in a ginger, garlic, lemon and parsley sauce at Vestigius. Tender barbecued octopus with sweet potato. Apparently Portugal has the highest fish consumption per capita in Europe. So many sardines! Tinned sardines are popular in Portugal, and this shop sells them exclusively. On our last day, we enjoyed Pastéis de Nata with coffee for breakfast, and then headed to the Feira Da Ladra market. The 'thieves' market, as it's known locally, sits behind the impressive Monastery of São Vicente de Fora. We drank Portuguese wine, sifted through vintage posters and antiques, and listened to live music. I'd love one of these ceramic bull's heads on our kitchen wall! Before heading to the airport, we stopped for one more seafood lunch. Beautiful, fresh cod fillets at Faz Figura. P.S. More from our travels in Portugal, road-tripping through Porto, Lisbon and the Algarve.